This class is an exciting introduction to ballet, tap, creative movement, and tumbling basics. The focus is on having fun and giving your child a positive introduction to dance. No experience is necessary. Black tap shoes required, pink leather ballet shoes recommended. Students can wear any type of comfortable clothing, but many enjoy wearing little leotards and skirts (any color and style, tights optional). We recommend that you put your child's initials in the shoes and have her bring a little bag to class with her ballet shoes inside so she can change the shoes in class. Students will start the class in their tap shoes. 45 minutes. In this class children will receive a well-rounded introduction to dance. Using stories, props, and fun music your child will learn ballet, jazz, and tumbling skills. No experience is necessary. Pink leather ballet shoes recommended. Students can wear any type of comfortable clothing, but many enjoy wearing little leotards and skirts (any color and style). 45 minutes. This class is an exciting introduction into hip hop, tap, jazz, and tumbling basics. The focus is on having fun and giving your child a positive introduction to dance. This class is great for boys and girls! No experience is necessary. Black tap shoes required, and bare feet, tennis shoes, or ballet shoes may be worn for the hip hop/jazz portion of the class. Students can wear any type of comfortable clothing. We recommend that you put your child's initials in the shoes and bring a little bag to class that he/she can put the tap shoes in when they change in class. Students will start the class in their tap shoes. 45 minutes. In this high energy class your little cheerleader will learn basics such as arms, jumps, and kicks. They will also learn tumbling skills that build coordination and strength such as forward rolls, handstands, and cartwheels. No experience is necessary. Wear comfortable clothes that are form fitting and easy to move in, hair pulled back in ponytail or pig tails. Bare feet are recommended. 45 minutes. Fairytale ballet is an enchanting introduction to ballet and jazz technique in a fun and creative environment using story time, props, and dress up costumes (provided by the studio) to make each class a magical experience. The focus is on having fun and giving your child a positive introduction to dance. No experience is necessary. Ballet shoes or bare feet are fine. Students can wear any type of comfortable clothing, but many enjoy wearing little leotards and skirts (any color and style). 45 minutes. Fairytale ballet is an enchanting introduction to ballet and jazz technique in a fun and creative environment using story time, props, and dress up costumes (provided by the studio) to make each class a magical experience. The focus is on having fun and giving your child a positive introduction to dance. No experience is necessary. Pink leather ballet shoes recommended. Students can wear any type of comfortable clothing, but many enjoy wearing little leotards and skirts (any color and style). 45 minutes. This class is an exciting introduction to ballet, tap, creative movement, and tumbling basics. The focus is on having fun and giving your child a positive introduction to dance. No experience is necessary. Black tap shoes required, pink leather ballet shoes recommended. Students can wear any type of comfortable clothing, but many enjoy wearing little leotards and skirts (any color and style, tights optional). We recommend that you put your child's initials in the shoes and have her bring a little bag to class with her ballet shoes inside so she can change the shoes in class. Students will start the class in their tap shoes. In this class children will receive a well-rounded introduction to dance. Using stories, props, and fun music your child will learn ballet, jazz, and tumbling skills. Pink leather ballet shoes recommended. Students can wear any type of comfortable clothing, but many enjoy wearing little leotards and skirts (any color and style). 45 minutes. Ballet is the technical base for all other styles of dance taught at the studio. Students will develop strength, poise, and flexibility as they learn routines and work on barre and center floor skills. For ballet only classes the dress code is more formal: black or pink solid colored leotard, ballet pink tights, optional black or pink ballet skirt, hair in a bun, pink leather ballet shoes (ties tucked in). Bring a water bottle. Tap dancing is an enjoyable style that allows the dancer to make rhythms and music with their feet. Students will develop coordination and speed as they learn routines and work on barre and center floor skills. Students can wear any type of comfortable clothing that they can move easily in. Black tap shoes required. Bring a water bottle. 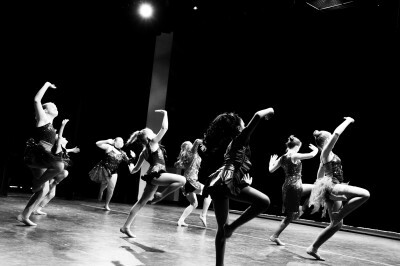 Jazz allows dancers to develop technical skills such as leaps and turns and incorporates them into dynamic dance routines using upbeat music from a variety of genres. Students can wear any type of comfortable clothing that they can move easily in. The instructor will make recommendations on the type of shoe being used for upcoming performances (color and style), but in class dancers can wear any type of dance shoe or bare feet. Bring a water bottle. Lyrical uses a combination of jazz and ballet skills to tell a story through movement using the lyrics of a song. Students can wear any type of comfortable clothing that they can move easily in. The instructor will make recommendations on the type of shoe being used for upcoming performances (color and style), but in class dancers can wear any type of dance shoe or bare feet. Bring a water bottle. This class combines various aspects of the arts such as dancing, singing, and acting into one fun class! Students learn dance recital routines that showcase the basic jazz skills they learn using songs from popular musicals and movies. Students will be introduced in class to basic voice exercises and learn to sing in harmony in a small and large group. Students can wear any type of comfortable clothing that they can move easily in. The instructor will make recommendations on the type of shoe being used for upcoming performances (color and style), but in class dancers can wear any type of dance shoe or bare feet. Bring a water bottle. In this class your child will build strength, flexibility, and coordination. Children will be taught tumbling basics such as forward rolls, handstands, cartwheels, back walkovers, aerials, back handsprings and more! Each child will be encouraged to advance at his or her own pace safely. No Experience Necessary. Form fitting clothes, bare feet, hair pulled back. Bring a water bottle. Students will learn some of the newest dance styles, jumps, and tricks in this high energy class. Students can wear any type of comfortable clothing that they can move easily in. The instructor will make recommendations on the type of shoe being used for upcoming performances (color and style), but in class dancers can wear any type of dance shoe, tennis shoe, or bare feet. Bring a water bottle.